Slate is a soft, metamorphic stone made up of several layers of compacted shale and sediment. It can be found in tiles that have been honed to a smooth surface, or left in a natural, cleft state. Both types of slates have a matte surface that can appear chalky or dusty, with small pieces that may break off easily. 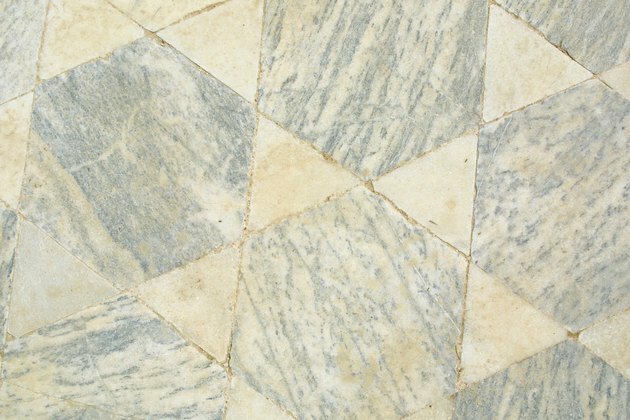 Scratches and scuff marks are also common on slate floors. While these marks can be left alone to add to the character of the floor, they can also be removed with minimally invasive techniques. Slates with a great deal of texture and color variation may hide scratches better than single color stones. Pour a small amount of water onto the scuffed or scratched area. Work the scuff or scratch in a circular motion using 800 grit wet/dry sandpaper. This will help even out the scratched area with the rest of the surrounding stone to help hide it better. Rinse the slate with fresh water and dry it with a soft cloth to examine the scratch. If it is still highly visible, add more water and continue to work it over with the sandpaper. If it is faint to the eye, allow the area to dry completely. Apply a thin coat of mineral oil to the entire slate floor at once to deepen its color, hide the scratch and scuff marks and protect it against new ones. Dip a foam paintbrush into the mineral oil and paint the oil onto the slate in slightly overlapping strokes. Pay close attention to clefts, chips and voids in the stone to ensure even coverage. Let the mineral oil soak into the slate for 10 minutes, then wipe away any excess with a soft cloth. Allow the slate to dry completely before walking on its surface.